Finally, the big moment is here! hireXp helps you make data based decisions by showing overall scorecard of all the interviewers in a single window. Now you can speak with the interview panel and take a collaborative decision without relying on the memories of the panel or just believing the seniormost person in the room. hireXP provides complete data of the scorecard with the panelist name and you can easily see who said what. This is the amazing way to move the candidate ahead in the pipeline and roll out an offer. Simply, create an offer and send it to the candidate or upload a pre-worked offer and send it to the candidate. 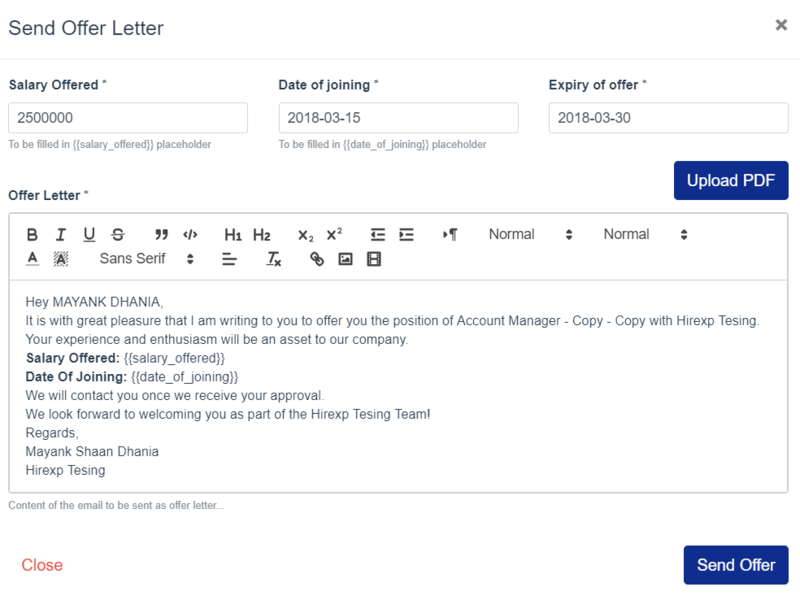 hireXP automatically change the staus of the candidate as per acceptance or rejection of the offer sent.